King Krule - "Biscuit Town"
Men I Trust - "Tailwhip"
Sade - "Is It A Crime"
Grizzly Bear - "Ready, Able"
I'm happy to share that I was selected to be one of 55 photographers featured in Bloom Publishing's upcoming book, OPEN. The photo they chose is from my Cementerio de la Chacarita series, and is possibly one of the best images, if not luckiest, I have ever created. I've told the larger story about Chacarita Cemetery in Buenos Aires, but it is such an interesting place that each photo offers its own story. This is especially true with the photo chosen for OPEN. Chacarita Cemetery is sprawling, with many sections, eras and styles to explore. In the heart of it all there is a chapel and a space for funerals to gather. I approached the area looking for a restroom, having wandered the grounds for a couple of hours. It was hot, so I circled the shady edges of the buildings and peeked into open doorways. 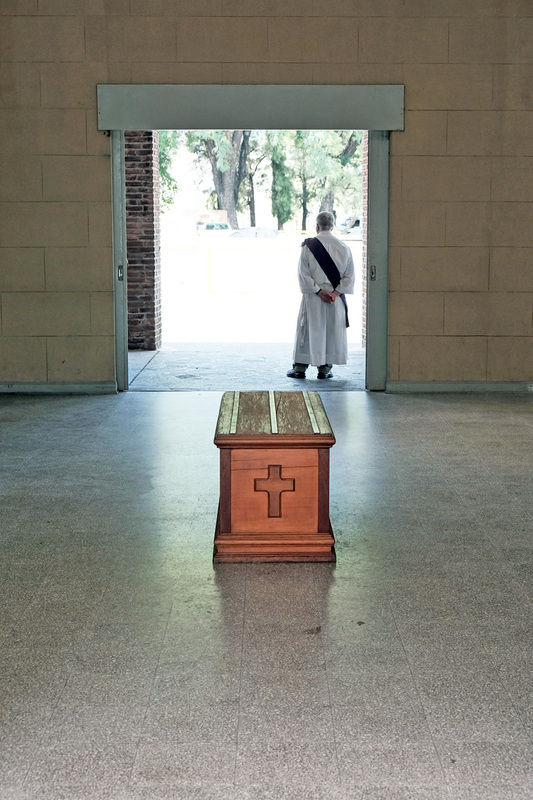 The first large room I looked into was empty except for a pedestal awaiting a coffin, and a priest. I could see through the to the other side, and heard a funeral party gathering nearby. I sensed the need to be even more delicate, and unobtrusive. It is one thing to peacefully stroll through resting places with a camera - it's altogether different when a family is laying someone to rest. So I continued down the back side of the building, retaining my invisibility. At a well-shaded inner corner, I saw a doorway into a chapel. The space seemed cool and airy, despite the bright and forceful summer day. I approached softly to look in, thinking the space might have a photo or two waiting. One step in, maybe two, I paused when I noticed the seated clergyman. I realized that he must be waiting to perform his duties, and was messaging someone, or browsing the internet, with his down time. My camera was up in a heartbeat - I didn't move from the spot, centered on the massive candle stand, and zoomed in enough to still include its full height. Occasionally I get the feeling that a photo is nearly perfect as soon as I capture it, and that was the case here. I quickly snapped the frame a couple of times to ensure that one would be appropriately in focus, and then backed away from the chapel. The clergyman stood up not long after. I had chanced upon a rare moment, surrounded by aesthetically appealing elements that were both commonplace and surreal. The holy man pecking away at a ubiquitous, modern device, kept company by "plugged-in" objects such as the facsimile of a flame, created an image that many rightfully find ridiculous, while others may find it more profound. I don't hold the same contempt for all of organized religion in the way that many do today, though I understand where the contempt originates from. There's a lot of beauty in it. Personally, I substitute cheekiness for the cynicism some feel about this image. The image resonates with me in a way that brings happiness and contemplation. A faceless clergyman prone to the same boredom and frivolity as any other human - are they texting God? Or swiping right on Tinder? Depending on one's perception of religion, or connection to spirituality, this image can evoke cynicism or humility. The cynics aren't wrong. We often put too much faith in our intermediaries - the leaders with comforting answers. At the same time, we are all simply and incredibly human, seeking a route to communicate with what is real and true. Are we ornate, well-crafted implements at the receiving end of a power cord, drawing energy from the universe to recreate the elements of reality that bring us comfort? Am I reaching? Doesn't matter. It's a damn good photo anyway. Soft Hair - "Lying Has To Stop"
Class Actress - "Journal Of Ardency"
Freddie Gibbs & Madlib - "Harold's"
Ariel Pink - "Dayzed Inn Daydreams"
King Krule - "Czech One"
Todd Terje - "Inspector Norse"
XTC - "Making Plans For Nigel"
Shout out to Elon and Claire. Grand National - "Drink To Moving On"